I never had a dog until I was a senior in High School. We had been living in Maryland for about three months when Rusty came into my life. I had a couple friends from the Surf and Psych shop down near our house in College Park. 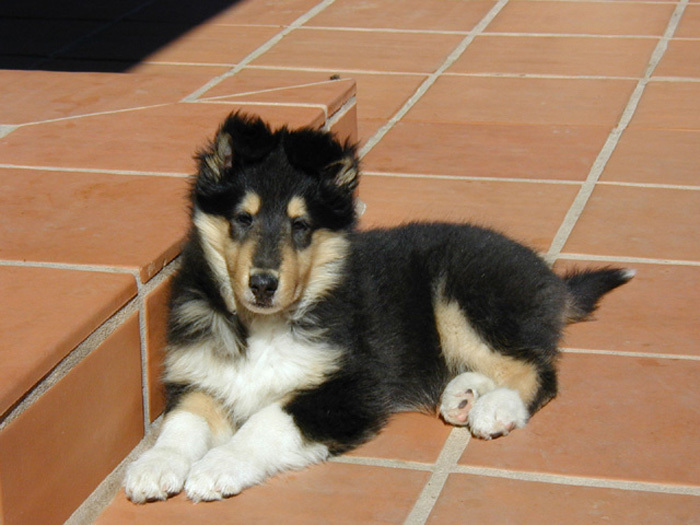 My friend Skip drove over one day and asked me if I wanted a collie. I told him I thought I would and he brought over this beautiful 6 month old collie he found on the street in Washington D.C.. He told me he kept the collie for three weeks and advertised in the lost and found section of the paper and put up signs but never had a nibble from anyone that had lost a dog. He named the dog Rusty and that name was fine with me. I took Rusty home to meet my parents. I remember passing my parents in the street in front of the house when I went to go pick up Rusty. "Where are you going?" my mother said. "I am going to see a dog" I said. "Don't you dare bring a dog home" she said. Of course I knew when they saw Rusty they would fall in love with him as I did. When my parents did come home, Rusty jumped up and kissed my dad. 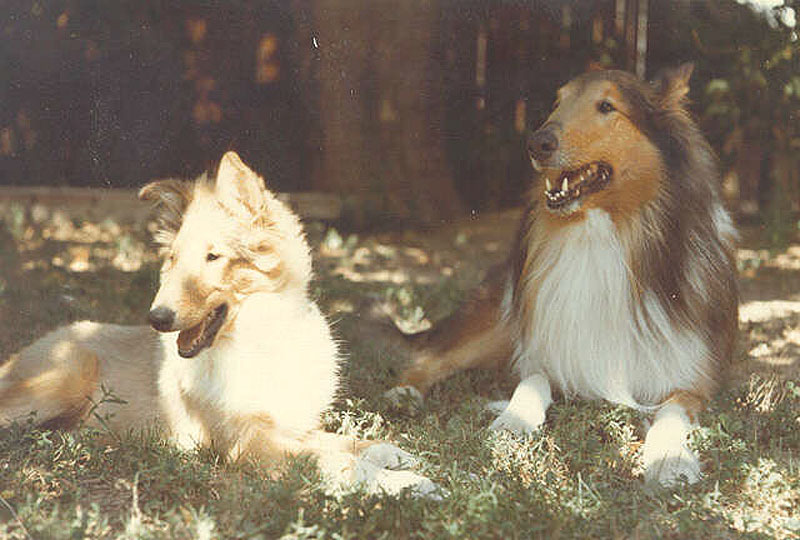 Dad always loved dogs, particularly collies. He had a border collie named "Rover" when he was a kid. You can read about my dad and his life story by clicking here. Rusty immediately became part of our family. Everyone loved Rusty. Surprisingly enough, I believe it was Rusty that made Rhonda fall in love with me. I would have never been able to catch her if I didn't have such a great dog. JENNIFER 1976 - 1989 (a friend for Rusty) Soon after Rhonda and I met, she thought it would be a good idea to get a "friend for Rusty". We watched the papers until we found someone with Collie pups. After a drive out to Virginia we found our Jennifer. 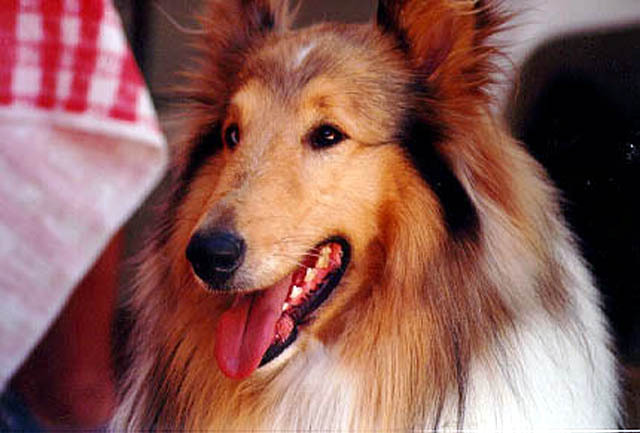 Jennifer had the exact same coloring as Rusty and was a perfect girlfriend for him. The lady that was taking care of the pups was an old drunk. I remember her asking if we would go pick up some beer for her. The woman, however, was particular about who was taking Jennifer. We couldn't take her with us that day, she had to think about it. 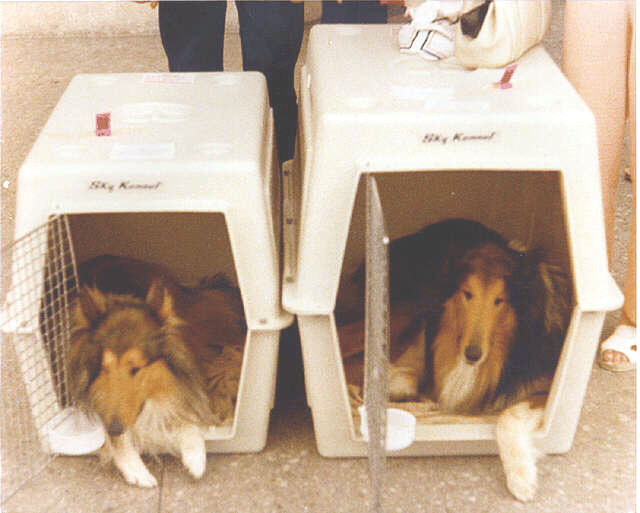 We were patient and soon, had two collies living with us in our house on Eutaw. Rusty was a "barker". He could bark 24 hours a day. We tried to keep him inside most of the time as he wouldn't bark so much inside. The squirrels and birds outside our house in College Park were too much for him. One day we got a letter from the city stating that someone had complained that our dog was barking too much. They referred to Rusty a "nuisance". We got and still get a kick out of them calling him a "nuisance". The real problem was that they threatened to take the dog away. We called Rhonda's brother and sent him the letter. Since he was an attorney, we felt he would give us good advice. This was the beginning of my understanding of the complexities of government and the law. We could answer this complaint in such a way that no reasonable person would want to follow up. They would immediately think we were going to be such a pain that they would try to push our paper work aside and hope we would go away. After all, we knew Rusty barked, but we were always careful to make sure that he never barked early in the morning or late at night. We only let him out of the house a few hours a day and the complaint stated that he barked 24 hours a day. So our letter asked for a ton of documentation. The name of the person or persons making the complaint, times and dates of the alleged barks, and a ton of other details. We never heard a word again about it. As Jennifer grew up Rusty became interested in her at "particular times" determined by the laws of nature. We tried to separate them as best we could. Often when Jennifer was in "heat", we would take Rusty over to my parents to stay for a week or so. Finally, we wanted to let them breed so we could have puppies. We particularly wanted to have a bloodline of the two dogs as they were such beautiful and terrific animals. Just as luck would have it, they mated just as Rhonda was going down into their room in the basement. She had never seen two dogs mating before and thought they were stuck. We had heard of pouring water on dogs that were mating to separate them, so Rhonda filled up a bucket and poured it on the dogs. We did want them to mate, but we thought they were in trouble. Later when we found that this was part of the normal mating procedure for dogs we were really embarrassed. I particularly remember the look on the two of their faces. Rhonda was screaming and then dumped water on them. They didn't move. The stayed together and just gave us a confused look. We were leaving on a European vacation a few days later. Mom and Dad have always been our "dog sitters". We told them that if Rusty and Jennifer wanted to mate, it was OK as we hoped for Jenny to get pregnant. When we got home, I remember my father saying "I'm sure she's pregnant by now" indicating that they had done little else but mate the entire time we were gone. We had fun watching Jenny grow fat with puppies. Finally, she started scratching around the house. Rhonda told me she knew Jennifer was going to give birth any day so I built a huge box in the basement. In the middle of the night, Rusty began to bark and bark, much more than ever before. I went to the basement door, opened it and looked in. Rusty stood at the top of the stairs and immediately turned and ran down as soon as I opened the door. 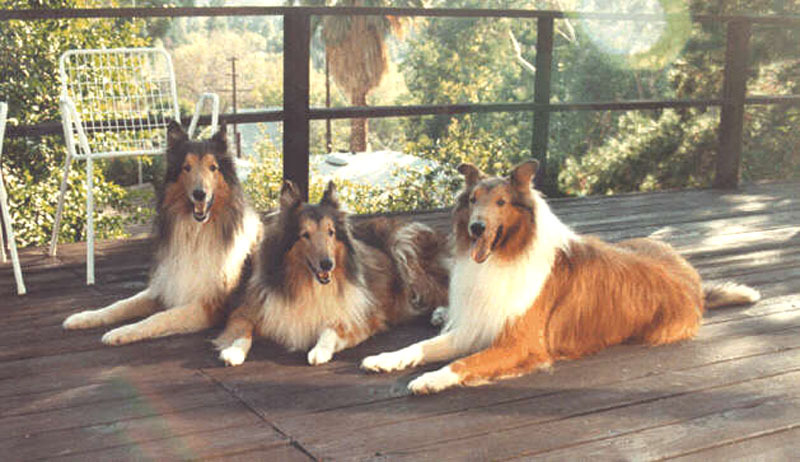 This was just like in Lassie, I thought. I followed him down the stairs and sure enough, Jenny had 4 puppies. We were so excited. They were just like tiny little rats. We let Jenny out to "pee", brought her back in and went back to bed. By the morning she had a total of 10. She had eaten almost all of one and was half way though another one. We assume two were born dead. 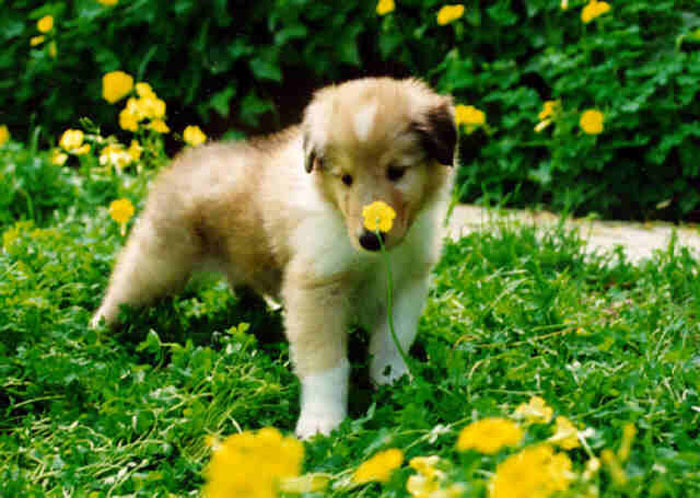 The others looked fine and grew up to be wonderful pups. I particularly remember two of the pups. Dudley and Schnorkel. Dudley was black and white or "tri" and Schnorkel was the biggest of the litter and looked just like his mom and dad. We gave Schnorkel to my old room mate, Dan Mayer and sold Dudley to a woman that worked with me at PBS. The other dogs we sold easily in the newspaper. 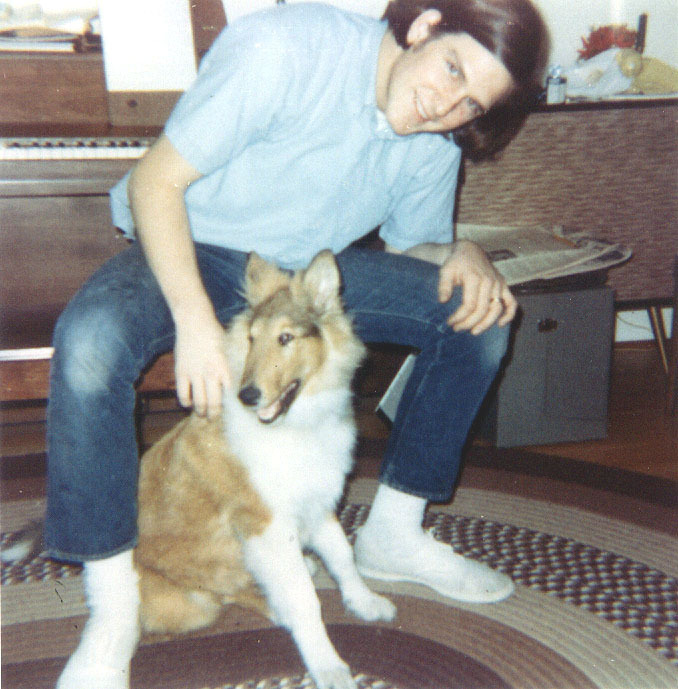 When we moved to California in 1979, of course we were going to take the dogs with us. Since we had no place to live, we left both Rusty and Jenny with my parents in Seabrook Maryland. After about 2 months, we had a house in Woodland Hills and could send for the dogs. My parents gave both of them drugs, put them on the air plane and they came out here on American Airlines. What fun it was to go pick them up at the airport. Both of them coming down the ramp in their dog carriers. 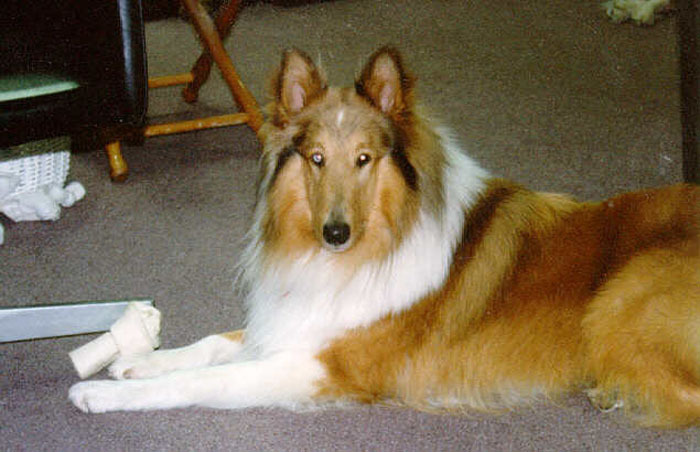 Rusty and Jennifer lived with us in Woodland Hills until Rusty had to be put to sleep when he was 13. He was just falling apart and the vet indicated that he knew Rusty would never get any better and that he was a pretty unhappy dog. I left the vet in tears and went to see Rhonda to tell her that I had let the vet put Rusty to sleep. It was a sad day for the whole family as Rusty meant so much to all of us. Rhonda insisted that we immediately get another dog. We started looking around then found a breeder that had a new litter near San Bernadino. We made the long drive out there with Geri Baur. 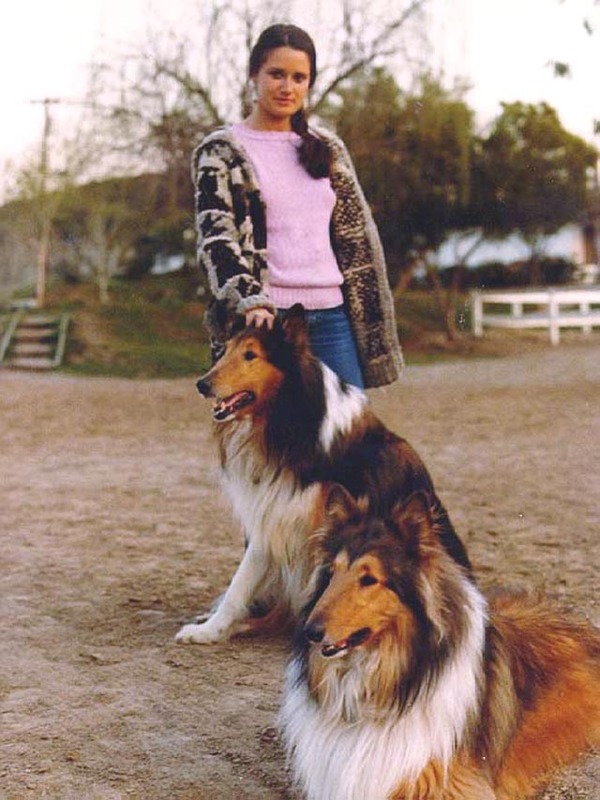 Geri also was a dog lover and had a couple of dogs herself. Rhonda identified the dog she wanted immediately. We called him Nicholas Russ Amalsi. 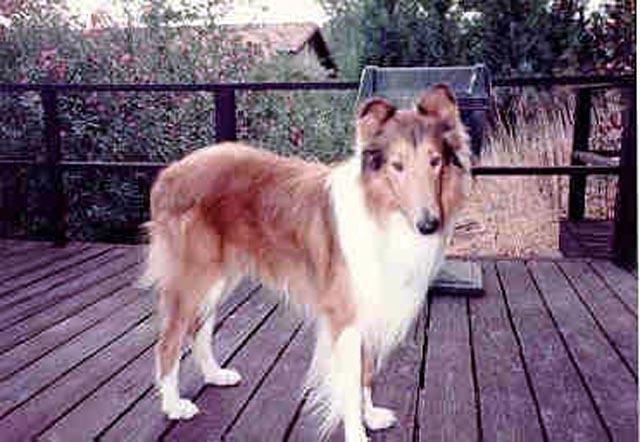 Amalsi was the breeder's line name and Russ was named after Rusty. We just liked the name Nicholas. Soon, as Nicholas started growing up, we started calling him Mr. Nick. I loved calling him Mr. Nick; it was such a dignified name. Nick was quiet, never barked and was the sweetest dog we ever had. He lived well with Jenny and the two were best friends. Some years later, Dan called me and told me he was going to have to get rid of Schnorkel. I couldn't believe this as I knew he really loved that dog. After a short discussion, I realized that it was his wife at that time. This woman didn't like the dog, never did and never would. Dan was making a final attempt to appease her. We took Schnorkel and had three dogs for a while. What a challenge having two males. They would fight constantly. We had to keep them separate. Separately, though, they were both as sweet as could be. We were just getting the hang of having two dogs that couldn't be left alone together when suddenly Schnorkel died. We think it was a disease called "torsion". Sometimes the intestines of larger dogs can get twisted up. When this happens, if you perform immediate surgery, you might be able to save the dog. Usually the dog gets really sick really fast and just dies. This is what happened to us. He didn't look so good one night, we went to sleep and in the morning he was dead. The end of this story is that Schnorkel died on Memorial Day and Dan's wife left him anyway. We didn't replace Schnorkel. Having two dogs at a time is enough for anyone. Jenny lasted about 13 years also. She died in her sleep. So it seemed anyway. When we went into her room, the garage, she was lying there, looked asleep, but was dead. We were really sad but she was just about as old as collies get anyway. Again, Rhonda wanted to replace the dog immediately. We found a breeder in the Valley who had an older dog, almost 1 year. She had raised the dog for her daughter and her daughter could not keep it. As it turned out, this was a "tri" again. Just like Dudley. We fell in love with her and took her home immediately. 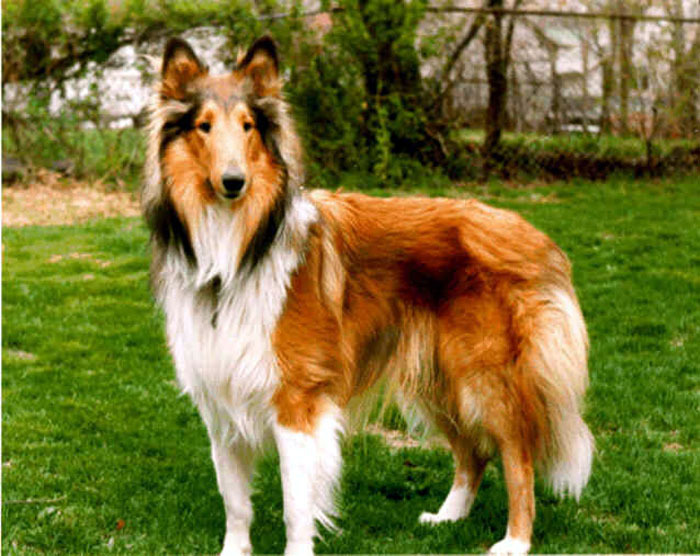 When people find out how many collies we have had, they usually will not hesitate letting us whatever dog we want. 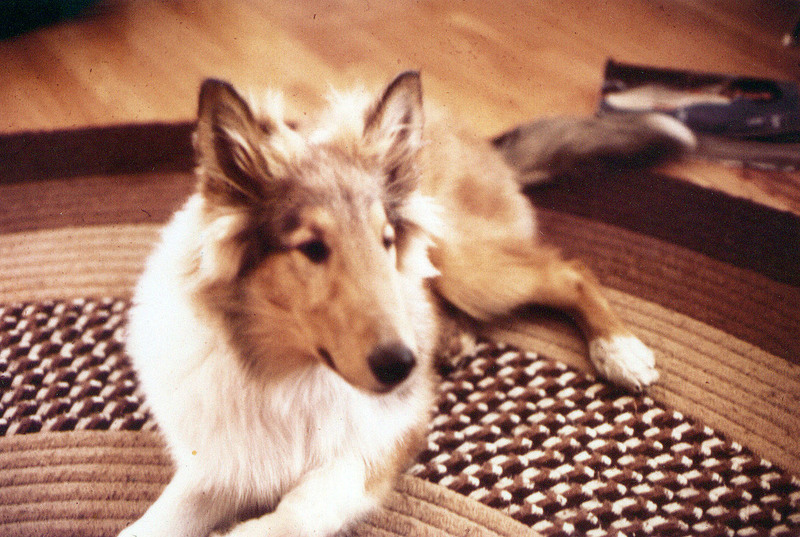 We still have Sally and she is only 7 years this year, 1995. 1995 is the year that Mr. Nick left us as well. He grew older and older faster it seemed in the last year. He was such a good boy. He never did anything wrong and was always sweet and quiet. I remember the day that he would not jump up on the bed. That was the sign to me that he was getting older. He was always healthy so when he went, we kept thinking he was just sick. After many vet visits the final days were particularly sad. He just stopped eating and would not get up. The last day, he would not even drink water. I called the Vet and told him that I was going to bring Mr. Nick down to be put to sleep. Rhonda and I made the saddest trip ever; together to take Mr. Nick for his last ride in the car. He used to love to ride in the car. The Drs. at Mar Vista Animal Hospital were really nice when we brought Mr. Nick in that last time, we really appreciated that. Roger -- Of course we immediately started looking for another boy dog. We found one at a breeder way out in the Pasadena area. She had two boys. Both of them were really cute. They were a little older also and mostly house broken. Roger was 7 months old when we brought him home. He is the funniest puppy we have ever had. He loves to play with toys, balls and just about anything. This is a type of puppy we have never had before. At this time, he is just 9 months old. The most remarkable thing about him is the way he likes to lay down. 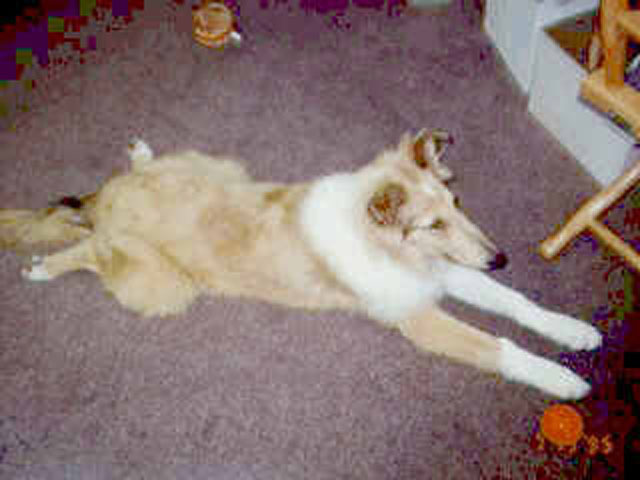 Flat on his stomach with his hind legs spread out to the side. We call it "frog style". So, December 1995, we have two dogs. Sally and Roger. I am starting to call him Mr. Roger, but it doesn't seem quite right. I will get use to it. Sally is 7 years old and getting pretty fat. She is teaching Roger the way of the world. They get into it from time to time, mostly fighting over a chew toy or a rawhide bone. In the summer of 2000, I was getting ready to go on location in Melbourne, Australia. 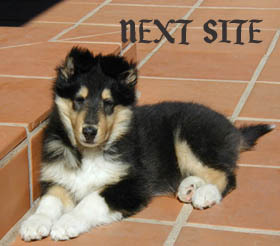 Just before I left, we found a beautiful new 8-week old baby tri-colored collie that we just had to have. It was a little difficult for Rhonda to take care of all three of them by herself, but it was worth it. Lucy is smart, cute and she and roger have become really good friends. As Sally is growing older, I even think she likes the stimulation that Lucy brings to the family. We particularly like the fact that Lucy sits on the floor like Roger. WE are wondering if she will keep sitting like a frog her whole life like Roger has. 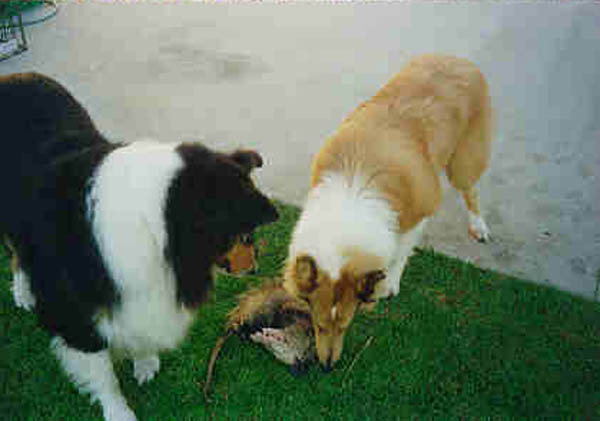 Roger and Sally Find an Opossum In Culver City ! 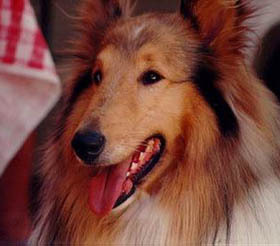 I am currently re-writing my Collie Page. Meanwhile, you can see some other dog pictures in the two albums below.